Last week, I described how to track product and non-product click-through rates in Adobe Analytics. This was done via the Products variable and Merchandising eVars. In this post, I will take it a step further and explain how to view click-through rates by placement location. I suggest you read the last post before this one for continuity sake. 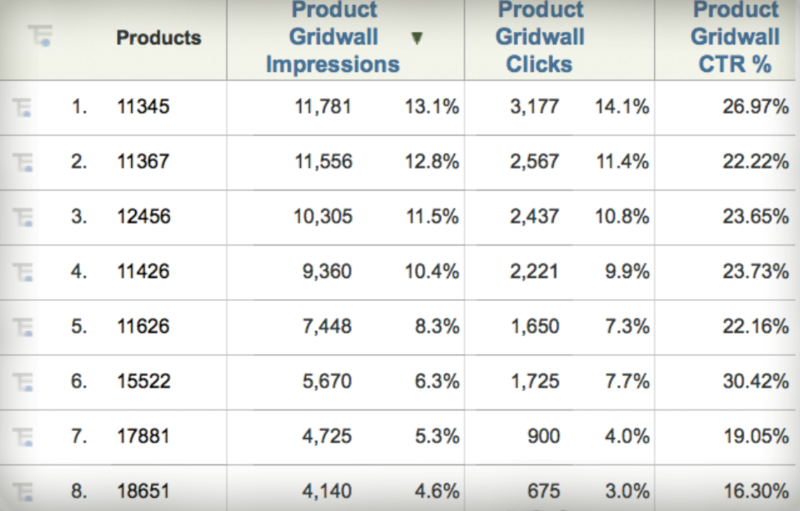 However, what if you wanted to see the click-through rate of each product based upon its placement location? For example, you can see above that product# 11345 has a click-through rate of 26.97%, but how much does this click-through rate depend upon its location? How much better does it perform if it is in Row 1 – Slot 1 vs. Row 2 – Slot 3? To understand this, you have to add another component to the mix – Placement. As you can see, the string is the same as before, just with the addition of a new merchandising eVar30 for each product value. This tells Adobe Analytics that each impression (event20) should be tied to both a product and a placement. And since the product and placement are in the same portion of the product string, there is an additional connection made between the specific product (i.e. 11345) and the placement (i.e. Row1-Slot1) for each impression. This allows you to perform a breakdown between product and placement (or vice-versa), which I will demonstrate later. In theory, you don’t need to set the merchandising eVar again on the click, since it can persist, but there is no harm in doing so if you’d like to be sure. Lastly, one other cool thing you can do with this is to view click-through rates by placement row and column using SAINT Classifications. 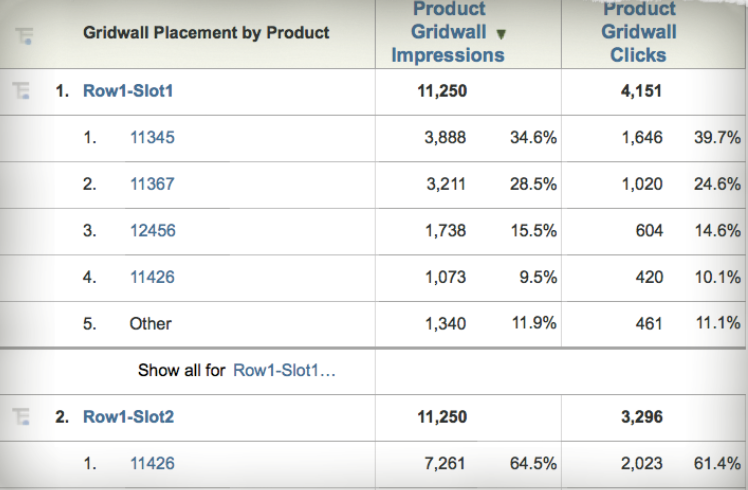 In the report above that shows click-through rates by Row & Slot (the one with 8 rows), you can easily classify each of these rows by row and column (slot). For example, the first four rows would all be grouped into “Row 1” and another classification would group rows 1 & 5, 2 & 6, 3 & 7 and 4 & 8 into four column (slot) values. 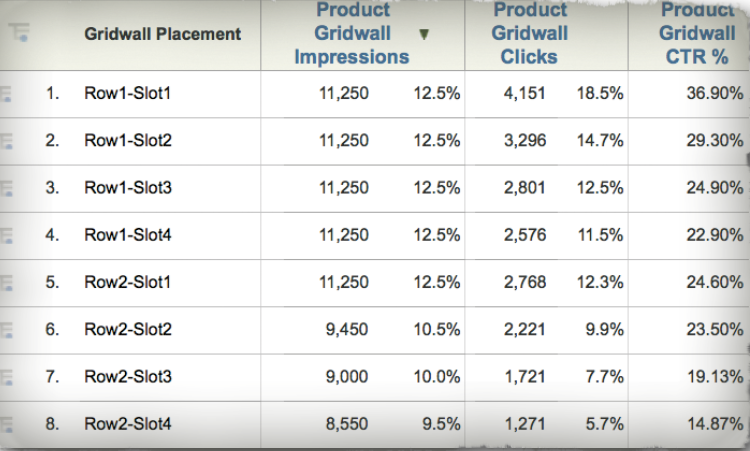 This would allow you to see click-through rate by row and column with no additional tagging. Another cool thing you can do is to embed a page identifier in the placement string passed to the merchandising eVar. This is helpful if you want to see how click-through rates differ if products are shown on page A vs. Page B. To do this, simply pre-pend a page identifier before the “Row1-Slot1” values, which can then be filtered or classified using SAINT. 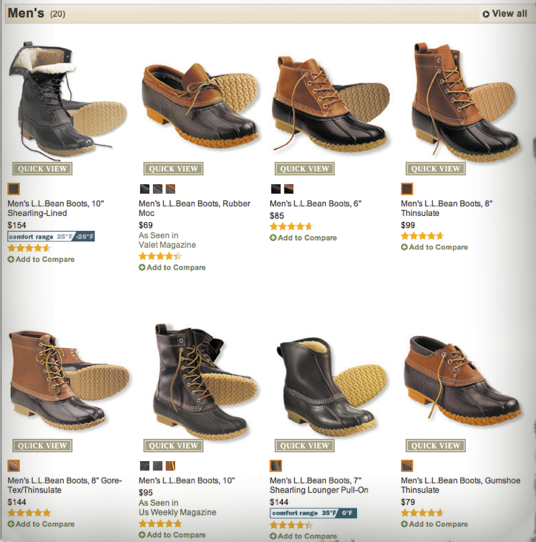 For example, you might change the value above to “shoe-landing:Row1-Slot1” in the merchandising eVar value. This would break out the Row1-Slot1 values by page and give you additional data for analysis. The only catch here is that you want to be careful about what data you pass during the click portion of the tagging, as you either want to leave the merchandising eVar value blank (to inherit the previous value with the page of the impression) or you want to set it with the value of the previous page so your impressions and clicks are both associated with the same page. If you are tracking impressions and clicks for things other than products (Ferguson example in my previous post), you can either include the placement in the merchandising eVar string or you can set a second merchandising eVar (like shown above) to capture the placement. Hence, with the addition of one merchandising eVar, you can see click-through rates by placement, product & placement, placement & product, row, column and page. Very interesting read. This was a feature I have introduced in the past but through another means as it wasn’t looking at offers and tiles instead of products. But the one thing I kept reiterating to the business is that this is not a CTR as this would be inaccurate. It was engagement on the position as the customer can click multiple times before the browser/device goes to the next page. To demonstrate this, there is roughly 11k impressions but 13k clicks (If we presume there is always a row1 slot1). This is nearly a 20% increase in clicks, which matched my previous analysis on this. Still very useful analysis, but a sense long as the right context of what this is reporting. Hi Adam, so what happens when we have the prodview event. I mean when user clicks on any product , he lands on the product detail page and here we have SKU beings displayed for customers. here we will trigger prodview event and in products variable we trigger the SKU. will there be any impact if I capture the impressions in the same products variables. Prodview event may associate with all the SKUs in the products variable. please suggest on this.